A hip and trendy new piece by one of our trend-setting designers. 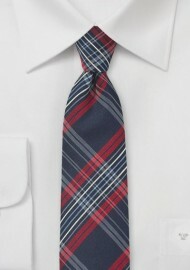 Tie maker BlackBird took a traditional navy and red tartan plaid and paired it with a trendy skinny width of just 2.5". It is the perfect juxtaposition of old-school charm with contemporary flair. If you like this design, then we are excited to tell you that this tie is also available as a trendy self-tied bow tie (see link below). This tie is made from a thick and luxurious silk fabric that was woven in Como, Italy by one of the world's best silk mills: BBC Jacquard. Handmade from pure silk.